I’ll be honest. I try to avoid eating out at almost all costs…figuratively AND literally! I try to think ahead, use the crock-pot or make portable meals a lot (go HERE to see 80+ different and easy crock-pot recipes). Sometimes with our crazy lives eating out is unavoidable. You’ve gotta spend some money, but there are still ways to spend less. 2. …then you can probably share a meal or order less. If I’m getting a plate of enchiladas I just make sure I am getting the biggest they offer. That way I can share or have leftovers! Yay for leftovers! 3. So for the no brainer. Drink water. Restaurants make a killing on drinks! Oh, and ask if they charge for the cup. If they do, drink your water you have in the car, unless the ice is worth the 10 cents to you. If we go down South toward the big city (Seattle) we almost always stop at Chipotle. Why Chipotle, you might ask? It’s fresh food. They incorporate more local food. They use a lot of organics. But the biggest one to my kids is that they serve soda water…for free. We NEVER buy our kids soda when we eat out, and we don’t keep any soda stocked in our house but soda water. The think it’s the best thing since sliced bread, and they don’t get much of that, either! 4. If you are road tripping and staying in hotels, carve a place in your trunk for the crock-pot . Yep, the crock-pot! This is the biggest money-saver I know on the road, as eating out quickly adds up. Plus, you get to eat WAY healthier. So I usually bring steel-cut oats and cook them overnight. Can-can chili is easy for lunch or dinner. We’ve even cooked a meal until we had to load up the car and then kept the food warm in the crock-pot. A reader suggested plugging the crock-pot into your car. Genius. 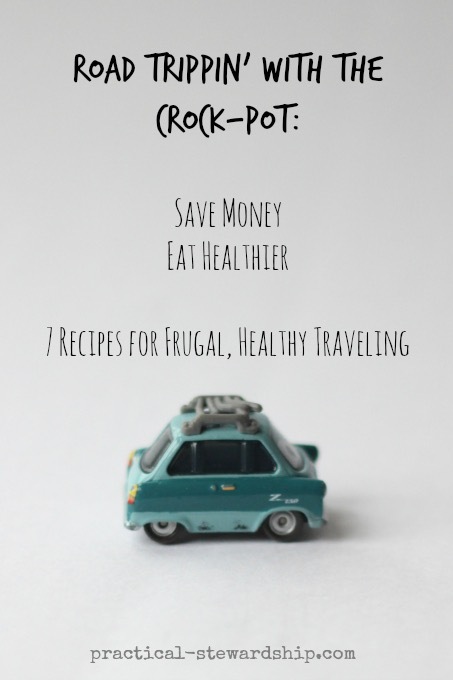 So here are 7 ideas for road tripping with the crock-pot. 5. Never order from the Kids’ Menu for a group of kids. It’s almost always a rip off and includes a soda they don’t need. Instead, order a big adult plate and have them share. When we go to Chipotle, they get the tacos, which has 3 tacos. One for each kid. Perfect (at least for our family now)! Plus with the free soda waters, they are good to go. For Part 2 visit Practical Stewardship HERE. 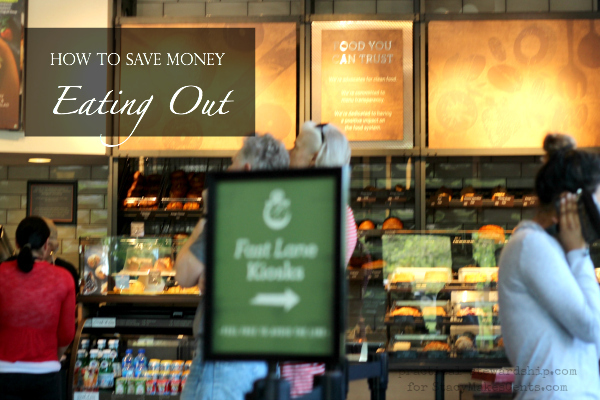 How do you save money eating out?